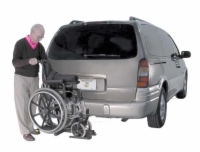 Wheelchair Carriers- Buy with Confidence from the #1 Wheelchair Carrier Distributor. Not all vehicles have the internal storage capacity to carry wheelchairs. For owners of such vehicles who need to transport mobility devices, we recommend these sturdy, reliable wheelchair carriers from AmeriGlide. Both the Tiny Tote 100 and the Manual Wheelchair Lift are compatible with Class I, II, and III hitches.